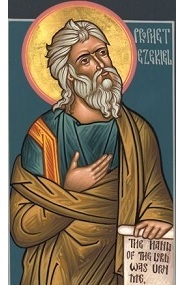 Ezekiel - One of the major prophets who is somewhat unique in that, while he was exiled in Babylon along with the rest of Judah, he lived a more or less autonomous life in the wilderness. Other Jews in exile came and listened to his prophetic statements, and some of the visions he received were of heaven itself. His ministry occurred in the first third of the Jewish exile.